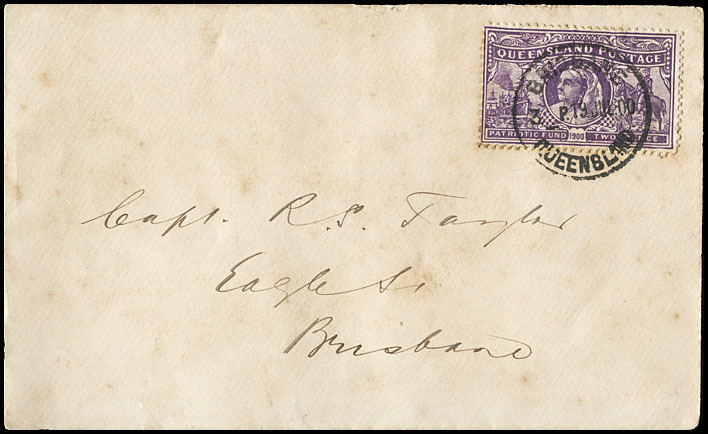 The 1900 Patriotic Fund issue of Queensland - 2d (1/-) on cover. The lack of interest in the issue led to few covers being produced. These covers were all philatelic. No recorded cover can really be classified as being a genuine postal use of either Queensland Charity stamp. 2d stamps are rarer than 1d stamps on cover. Most of the recorded covers do, however, come in pairs of both stamps. Provenance: Chartwell Collection 2006 (Spink May 2918 Lot 103). Brisbane for local delivery to A. Gruber Box 177 Brisbane. 21 June 1900 - 2 days after issue. As the date stamp is rotated a quarter of a turn clockwise, the large QL in an oval is below the stamp. Spink May 2018, Lot 103. Warwick for local delivery to Mr. Tweedie. Single franking overpays the required rate by 1d. Mossgreen October 2017 Lot 486. Brisbane for local delivery to Capt. Taylor. Spink October 1900, Lot 1395. Brisbane for local delivery to Mr. Gruber. 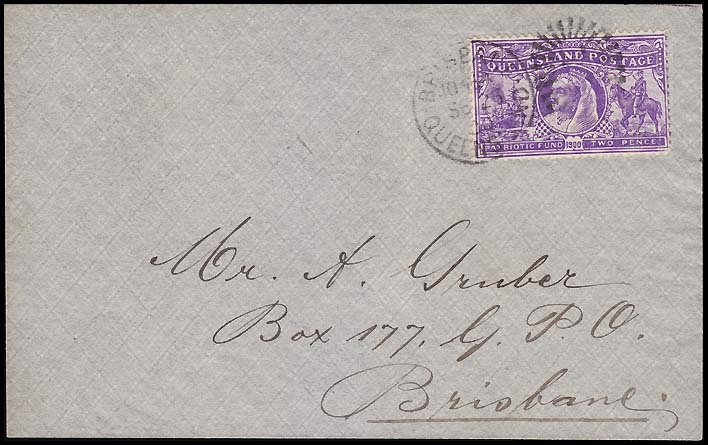 Another almost identical grey cover to that above and also addressed to Mr. A. Gruber has a similar single franking is with a Brisbane QL duplex of 26 June 1900. It also has an additional cancellation towards the top left corner (Millennium Auctions April 2003 Lot 593 and June 2004 Lot 76). Summary of recorded covers with single frankings of the 2d (1/-) stamp. 22 June 1900 Brisbane Matthew Bennett February 2003 Lot 573. 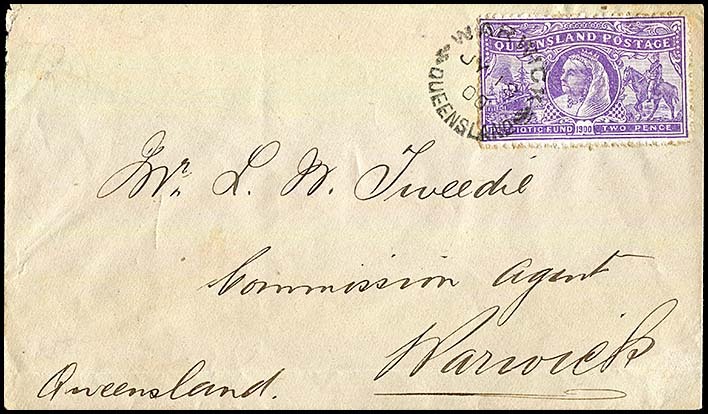 (plain cover addressed to Mr. L. N. Tweedie). Mossgreen June 2015, Lot 427. (3 pm - one line date). Brisbane - Eagle Street. (plain cover addressed to Capt. R. S. Taylor). (Grey cover addressed to Mr. Gruber with QL in top left corner.) Spink October 2012 Lot 1395. 8d franking - including a scarce strip of 3 - overpaying the 1d local letter rate. The largest recorded franking of the 2d Queensland Charity stamps. Millennium Auctions April 2003 Lot 590. 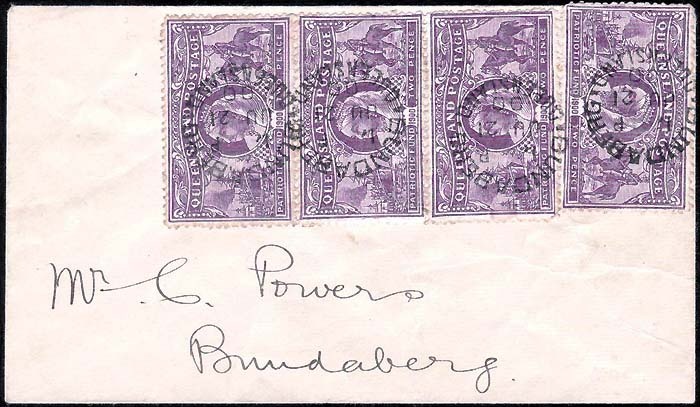 There is a similar franking to that above but with three 2d (1/-) singles addressed to the same correspondent with a Bundaberg cds of 20 June 1900. 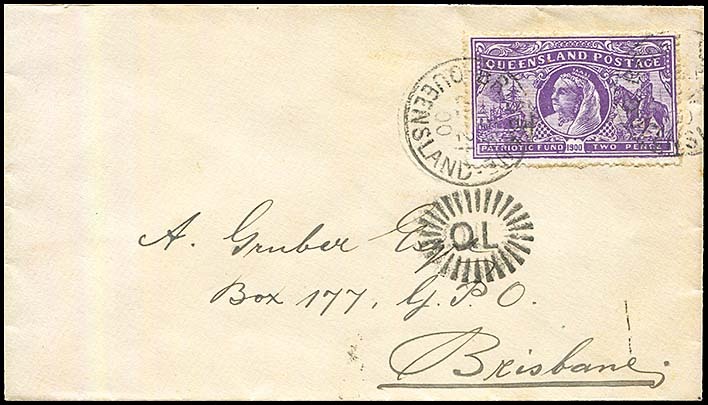 There are no recorded covers of the Queensland 2d (1/-) Charity stamp in a mixed franking with stamps from another issue.